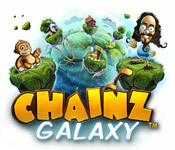 Chainz Galaxy is rated 4.4 out of 5 by 10. Rated 5 out of 5 by betskand62 from Linking chains game I really enjoy "Chains Relinked 2", but this is even more fun. They've added additional ways of linking and built in a short lag that allows you to make very long chains in many directions if you are quick enough. The cartoonish plot, involving Monty-Pythonesque little men on bits of planets which grow into one as you proceed, is less interesting to me than the game itself. I could play the game for hours. Rated 5 out of 5 by gottidabody from fun game I love this game very much. My kids and I are always fighting to see whose going to beat who. Rated 5 out of 5 by chipps611 from Enjoyable match 3 game, but not much challenge This is one of the easier match 3 games out there, with a twist or two. Rotate the chains to make your links, it'll hook you and keep you playing. The whole storyline of the men building the world (who look suspiciously like Jesus) is just plain cute. Found myself smiling more often than not after every cut scene. The story mode is what you play first, as you progress through that you eventually unlock strategy, puzzle and arcade modes. The one thing this game is missing is challenge. Story mode will take you a while to get through thanks to it's length (7 "steps" of a half dozen or so levels each), but is very easy. The graphics are excellent and the storyline is charming. The extra modes you unlock do make you think a bit, and all told it's an excellent way to pass the time. Rated 4 out of 5 by mrm2006 from Link Chains to get Power Ups If you like games where you have to link pipes together than you will LOVE this game. You link chains to form 3 or more to fill up the meter. Once the meter is full, you level up. There are charms you need to include in your links as well as bombs and portions of a special link shown on the bottom of your screen. While it was fun and somewhat addicting, it IS a strategy game because you have to link those links quickly or, before you're even finished linking them, BOOM - your link has exploded. So, yeah, strategy and speed is definitely needed. I enjoyed the game but am lousy at strategy games and am not so speedy anymore. For those reasons, this is not a buy for me but I do encourage everyone to give this unique spin on the pipe game a try. Happy Gaming! Rated 3 out of 5 by arnold1049 from MATCHING CHAIN LINKS INSTEAD OF TILES This is a little twist on the classic Match 3 games. Instead of swapping tiles to make matches, you must rotate the tiles to attach links to form a chain of 3. The grid is finished when enough matches have been made to fill up the big chain at the side of the grid. In addition, there are three modes of play; storyline, arcade and puzzle. The other two modes open up after playing a set number of levels in the storyline mode. Some links have charms attached to them and are collected when that link is used to make a chain. Collected charms are shown in the trophy room. 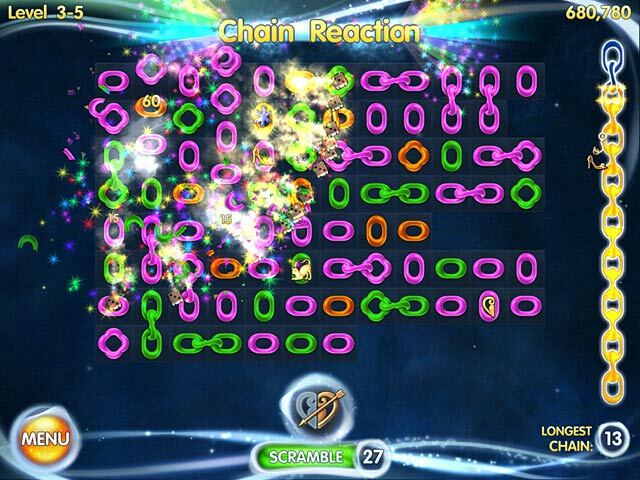 Powerups are obtained by making long chains and are activated when the link that contains the powerup is used in a chain. 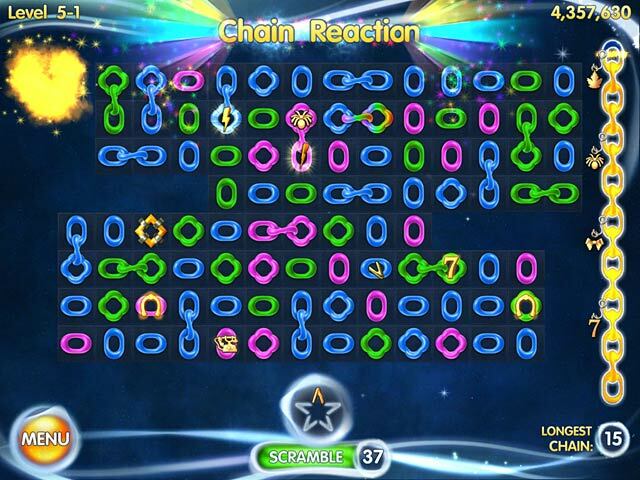 There are also wild (rainbow) links that allows chains to be made of two different colors. 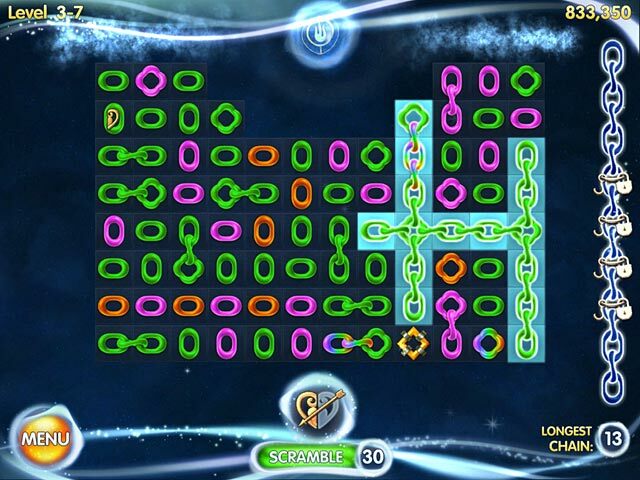 Scrambles are earned by making a chain out of a link that contains the symbol needed to complete the graphic at the bottom of the grid. When no links are available, then a scramble must be used; they are not automatic. A neat, change of pace Match 3 game that is a little ho-hum unless the two other modes of play raise it to a higher level. Not sure I will buy it to find that out, though. Rated 3 out of 5 by Ederek from Pretty but... Purrrty slick. Great graphics and story, but the levels all play the same. You wish you could skip the play to see what the guys on the planets would do... Also, there should be more explanation for the bonuses. What are the shoes and other golden goodies for? The demo was almost over until I realized that you can unlink chains to reuse their pieces. Often the game will not wait for you to connect all the pieces you can and will make a short chain instead of giving you time to complete the longest one.